Learning and learning outcomes are more meaningful to students when teachers engage their passions, unleash their creativity, and give them time and tools for innovation. Exciting classes interest students. These classes spark their curiosity. Sometimes, the learning here feels like play. A school may not be able to use these exciting ideas everywhere, but they should be used somewhere. If a school can't be interested in things that students care about, students will lose interest in caring about school. Here are five current practices to promote student curiosity, student interests, and play. Look at Ronald J. Bonsetter's "Inquiry as an Evolutionary Process" chart below. See how student-led inquiry gives students more of a decision-making role in the project? Some teachers are afraid that, by giving students too much freedom, they won't meet standards. First, share the standards with your students. Second, let students propose an inquiry-based project to meet the standards. This empowers student choice. Teachers will need to engage with students. Students will need coaching. They'll need advice as they create their final product. Rubrics can help them stay on track, but teacher involvement is essential. All projects are not alike. A teacher-directed, hands-on project can be as unexciting as an old-fashioned worksheet. Passion projects inspire curiosity and interest while still meeting standards. 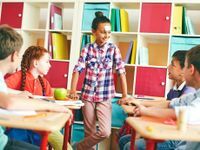 Many classroom best practices are circulating around Genius Hour and 20 Percent Time. In my classroom, I've learned to give students choices and help them set goals. By using a tool like Trello, I'm able to coach and track student work. Don't have an hour? There are other ways to foster a time to create and innovate. Some schools have puzzles or tools laid out in a certain place and change them out each week. Others issue a design challenge and let students invent ways to meet the challenge. I've found that great Genius Hour work revolves around problem solving or creating. Genius Hour is not recess or free play. It can help students reflect, incorporate the scientific method, provide materials and tools to spark creativity, and deliver an audience for finished student work. Some libraries are putting a makerspace in their learning commons. STEM labs, STEAM labs, and FabLabs are other ways to create places for making. Other schools have classes around making, robotics, or design challenges. Where is the makerspace in this school? A well-used makerspace means that students are inventing and creating. A makerspace might be in a corner or in a full classroom, but it should be somewhere. Let's discuss the ignored place for a makerspace: online. Why do teachers neglect one of the easiest places to create a makerspace? An online makerspace can be a web page, blog post, shared document, or anywhere. As you assemble this virtual creativity destination, include tools and apps to complete various projects by category, such as image editing, presentation, collaboration, drawing, cartooning -- you name it. Students and teachers might not be using these tools yet because they don't know what's available. You can change that by sharing the makerspace with everyone. A great way to start assembling your online makerspace is to have students do it. They can research different tools, test them, and add the ones that they think will work in this online environment. Tip: When assigning a project, never require a specific tool (unless you're teaching it). Instead, tell your students, "Create the multimedia artifact of your choice" or "Create a spreadsheet in the software of your choice." Help students be social entrepreneurs. Help them map their heartbreak. Join the #choose2matter movement and connect your classroom with other students who want to make a difference in the world. Survey your students' interests at the beginning of the year. 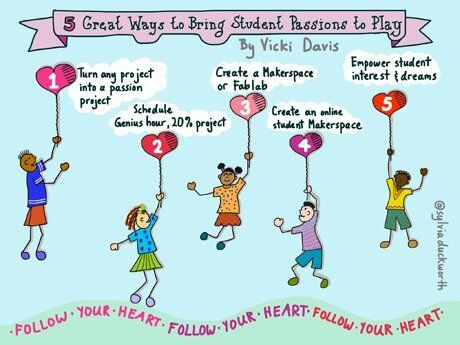 Create projects where they share their dreams with you and the class. The better you know your students, the better you'll know how to teach them. We can know our students' interests and passions. We can convert projects into passion projects. We can schedule times to create. We can provide physical and online tools to create. When you include students in learning, you can meet standards, but you can also meet more excited students at your door every morning.